In a previous Discerning the Times I talked about God’s peace plan for Jerusalem which is the wave of the Holy Spirit returning to Jerusalem and moving forward the fulfillment of the Great Commission. This wave is bringing the Jews back to the Land of Israel to faith in Yeshua haMashiach (Jesus the Messiah). This is really taking place in Israel and in Jerusalem with ministry groups that PRMI has been called to be in supportive relationship with. The Christian Mission to the Jews (CMJ) was first organized in 1808 in England, with CMJ first arriving on the grounds of Christ Church around 1815. The church building was finished in 1848 and consecrated in 1849. CMJ and Christ Church are the spiritual and practical beginning place for the restoration of Israel and we believe they will play a strategic role in the fulfillment of Romans 11. Check out the history and view pictures of this place at their official website. 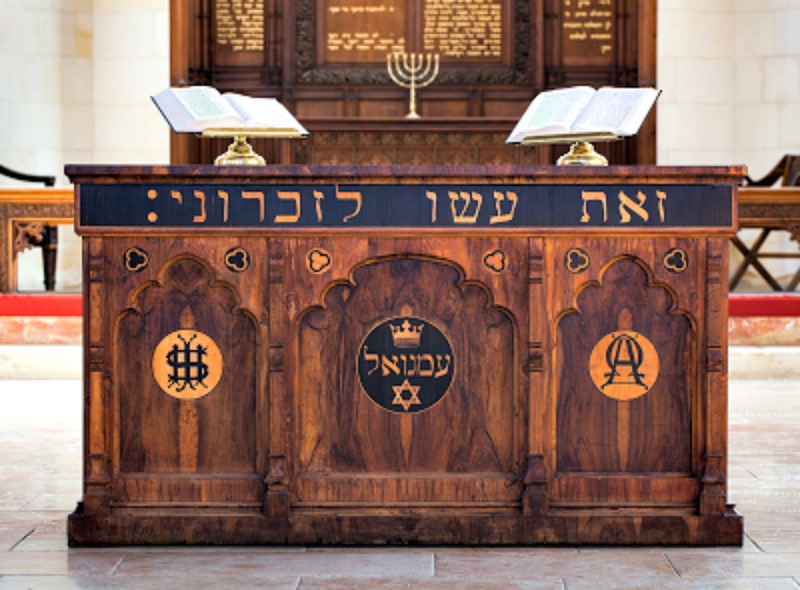 Christ Church is built so that Jews may come to know Yeshua, the Jewish Messiah for the salvation of all humankind. The rich symbolism in the Church depicts the prophetic vision given in Romans 11. 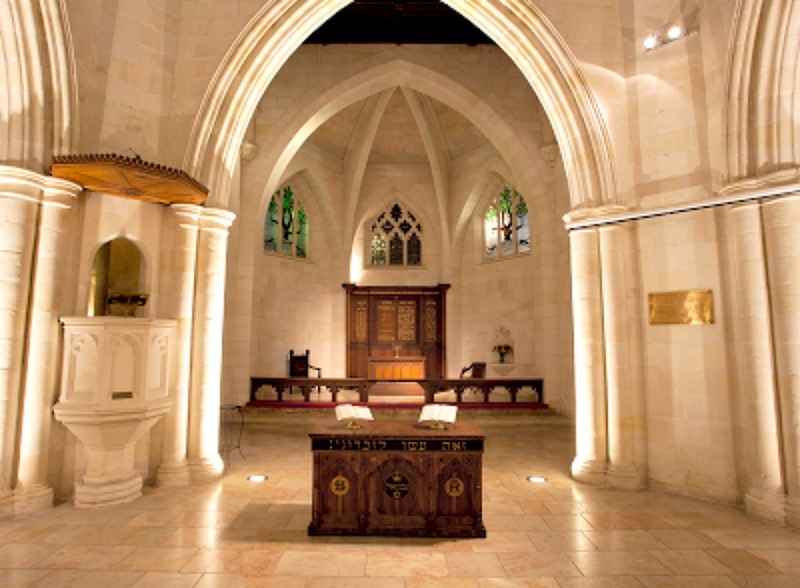 But there is no obvious cross; instead the gothic stone sanctuary is filled with the Old and New Testament Jewish symbols to witness to Yeshua haMashiach (Jesus the Messiah). Here is a video that I made of a Jewish follower of Yeshua reviewing this amazing history of God’s work which is the foundation for its future role in bringing the Jewish people not just back to the Land of Israel but to Jesus as the Messiah. The CMJ’s witness to the Jewish people in this location is the beginning place for God gathering the Jews from the nations back to the Land of Israel. But what is even more exciting is that God is presently using the ministry team at Christ Church to witness to the thousands of Jewish people, many Orthodox, who are led through the gates into the compound. There are also many Muslims who come in as well. Each day people from all nations as well as many Orthodox Jews walk by Christ Church on their way to the Jewish Quarter and to the Western Wall. We have many wonderful testimonies of how the Holy Spirit is creating a genuine curiosity among Jews and Muslims–the wind blowing where it will, as Jesus taught.? This is a supernatural move of God, and CMJ personnel are dancing in step with the Spirit as they respond to questions, sometimes in very lengthy conversations. Pray that their words would be guided by the Spirit, and that even the buildings and symbols would “speak” to those whose hearts and minds are yearning for the promised Messiah. Just an example of our daily work for sharing the knowledge of YeShua HaMaShiach. God is moving in incredible ways BECAUSE HE does listen and hear prayers from warriors such as those of you in Discerning the Times — thank you for all of your work, dedication, and constant prayers. Again, this week has been just great. One specific event that really stands out so far was Wednesday morning. I was in a men’s weekly morning group just preparing to get started on the week’s topic of time management for church leaders (the rocks in a jar scenario) when I saw two Ultra Orthodox Jews peering into the museum. I am usually the only one at the museum on Wednesday morning, so I lock it but watch for special visitors. Sure enough, these were special. Please understand that for Ultra Orthodox to even enter on the CMJ/Christ Church compound is almost always forbidden for them. The one rabbi…had actually been to the library for some research in the past two months and many of us had gotten to know him. We never approached him during his research but he was always in the middle of the library therefore he constantly got to see, hear, and feel all of everyone’s life at CMJ. (more specifically — the Love of YeShua HaMaShiach). He had come into the museum at least two other times just to look and listen at what all the fuss in that place was about. Anyway, on Wednesday morning, there he was with another young rabbi. I was very, very surprised by this visit and was kind of stunned actually. I was not sure what the purpose was so I asked how I could help them. Rabbi….said to just explain — so I started from the beginning — literally. 1.5 hours later, we all three were still in the museum and by this time the young rabbi began to start asking about ‘trial’ locations of YeShua. Yes, I was shocked. Evidently he had actually been reading the Brit HaDasha. He had too many pertinent questions that could only come from at least a brief study of the New Testament. In the early stages of the tour with them, I described how the compound comes about and the Church is almost always the center point at the beginning of any tour. At first, he said he would not go inside so we stood out in the courtyard discussing — his curiosity was just too much. He looked at the older rabbi basically asking if it was ok to enter and he just smiled and I led them in. He was floored, shocked, and exhilarated as he entered. He just kept smiling and spinning around taking it all in. We then discussed how it could be that a Jewish synagogue was inside a building called Christ Church (the Anglican Church) but had almost no ‘Christian’ symbols. This story in and of itself usually brings everyone to tears with the Holy Spirit and this time was no exception. We then headed all around the compound and back into the museum. As I said earlier, 1.5 hours later we were all still there and he began to ask questions that could only come from some level of reading/learning from the New Testament. What to conclude? Not sure exactly; however, I know that the older rabbi has admitted that the Orthodox community believes and knows that the time of the ‘coming’/returning of the Messiah is close. Yes, every generation believes this and every Jew–every day–prays for this, however things are different for this generation. Therefore, if the Orthodox community is to truly examine where they have missed God’s messages of the Messiah (i.e. from Maccabi’s, to Bar kokhva, to Schneerson, to Nachman) they will/must carefully and with sincerity consider whether this Jesus person was their Messiah. Why do I say this? Because the young rabbi made it perfectly clear between all the wow, wow, wow, wow at every turn in our discussions, that he is coming back to the compound and he will be bringing others with him. Now it is my turn to be saying the ‘Wow wow wow wow’. Ok, enough, God be with you all, keep you, bless you. For the CMJ staff to have the Holy Spirit vibrantly in and upon them as they are providing the ministry of hospitality as well as the witness to all who come through the gates. Also pray for covering and protection of each staff member from the near relentless spiritual warfare against this vanguard of the Gospel. That the Holy Spirit may continue to be poured out in the City of Jerusalem making manifest for all to see and experience – YeShua HaMaShiach (Jesus the Messiah) especially at this time of Passover and Easter. Pray for PRMI/DFI continued engagement in praying for and connecting with what God is doing at Christ Church. Wow, indeed! This is all an amazing affirmation of this prayer work that we are called to do! Our 2017 Jerusalem Prayer Endeavor will be back at Christ Church as our base of Intercession in Jerusalem in November. If the Lord is calling you to take part in this onsite intercession, please be in touch with PRMI Director Rev. Cindy Strickler at cindy@prmi.org. Thanks for everyone joining in this work of prayer. As always, please pass on any discernment you may have.